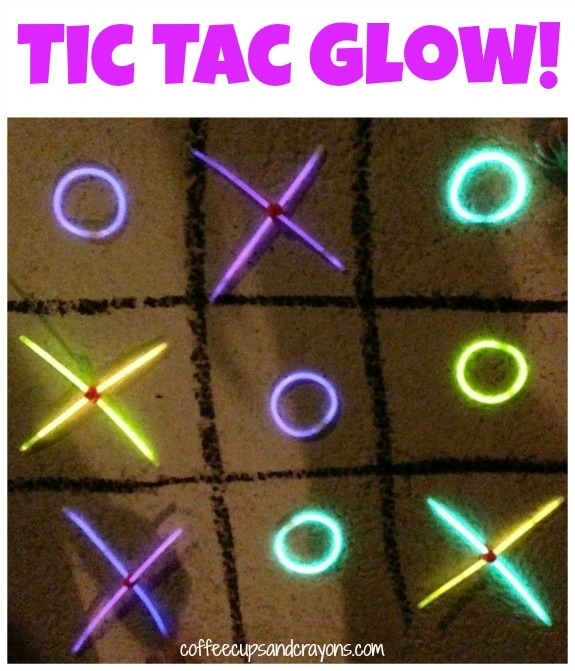 Glow in the Dark Tic Tac Toe! It’s summer time here and my kids, who normally go to to bed very early, are enjoying being able to stay up a little later! We’ve been having fun swimming and playing outside and roasting marshmallows in the backyard at night. Since they are staying up later they are also loving playing with anything that glows! 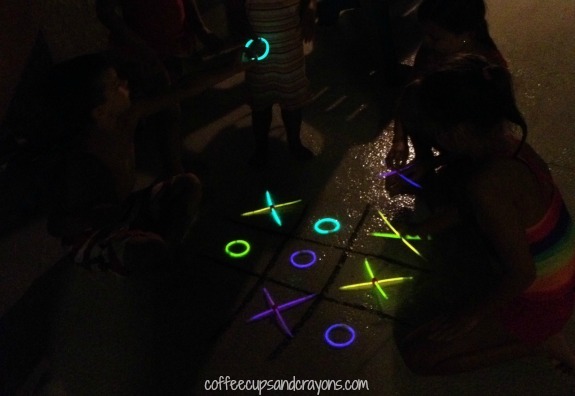 We love glow sticks so decided to use them to play one of our favorite games–Tic Tac Toe! This was super simple to set up. I bought a package of glow stick bracelets at the Dollar Store and used the connectors that came with the package to make the Os. Then I cut a pipe cleaner into small sections and twisted them around 2 of the sticks to make the Xs. We have a couple more glow in the dark activities coming up this month and I can’t wait to see what the kids think! This is FABULOUS!!! So simple, but such a fun way to make an “old game” new! Thanks so much for this fun way to play. Happy to add your post to our 100 Days of Play Blog Hop! Your post is now linked and will soon be shared over at SunScholars! Thanks Rachel!!!! We have been having so much fun playing in the dark! My son will love this! He’s crazy about glow bracelets AND Tic Tac Toe! Mine too!!! I’ve actually been “motivating” them to get things done with glow bracelets!